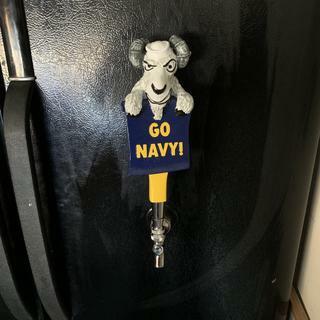 Calling all Navy fans – this novelty beer tap handle featuring Bill the Goat is made just for you. Every Navy fan knows that Bill the Goat is the official mascot of the Midshipmen. Now, you can bring the tradition into your home or commercial bar with this impressive Navy beer tap handle. This custom tap handle features a sculpture of a goat with an intimidating grimace. He’s holding up a navy blue banner that says, “Go Navy” printed in gold lettering. Handcrafted in the United States out of plastic resin, the Navy Goat bar tap handle is sturdy, tough, and ready for plenty of pours. The tap handle is specially made for Naval Academy graduates, those who have served in the Navy, or anyone who roots for the Navy football team. It also makes a fantastic gift. Measuring 9 inches tall, the Navy Goat Beer Tap Handle is the perfect size for your kegerator or beer tower. Since it’s designed to fit any standard draft faucet, you can replace your old tap handle and/or install this Navy Goat bar tap handle very easily: just screw onto the faucet lever collar atop your draft faucet. It can be screwed on from the bottom of the unit so that the goat and its "Go Navy" sign are facing outwards toward your bargoers. I received the tap handle very quickly and was extremely pleased when it arrived. To my surprise it was larger than I anticipated, which made it a perfect fit. The size and quality are exactly what I wanted, I was just unsure what to expect because this is the first time I have ordered this type of item. On a scale of 1-10 of Awesomeness, this is easily a 12. My uncle is a retired Navy Commander who is turning 80 next month. He has a kegerator with a boring tap handle. Thought he might like this one! It is cooler than heck. Retired Navy Chief, enough said! !